When it's coming to select a fly fishing rod, you have to pay attention to three elements that characterize the rod: the weight of the rod, the length of the rod and the action capabilities of the rod. The common fly fishing rods are made from graphite which make the rods much lighter than it used to be in the past. Of course there are rods that are made by other materials BUT since we are talking here about selecting rods for beginners, graphite is by far the recommended material for the rod; it is strong and light weight. Rod Weight - Lets divide the fly fishing rods to three weight groups. The first group includes 2, 3 & 4 weight rods, I'll relate to it as weight group 1. Rod weight group 1 is designated to catch small scale fishes and casting short distances for lakes and weak streams. Rod weight group 2 includes 5 & 6 weight rods and is suitable to fish almost everywhere as long as it is not extreme conditions. Rod weight group 3 includes 7 and larger weight rods and is perfect to cast long distances and catch heavy fish including strong current areas. 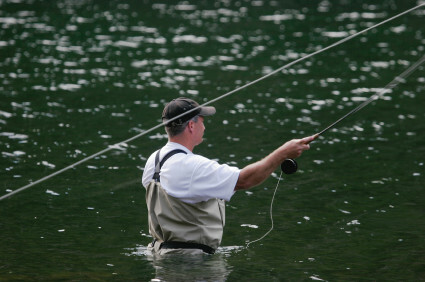 Rod Length � Fly fishing rods' length range is between 7 feet (around 2 meters) and 10 feet (around 3 meters). It is quite straight forward, a shorter rod is better for short distance casting like in places that there are obstacles such as trees, bushes etc, and longer rod is better when you are casting for long distances in a wide area. Fly fishing rods can come in two to five pieces. Three to four pieces rod is pretty comfortable to pack and move with and not less important, to store it. The rod's number of pieces is not causing any noticeable impact on its performance. Rod Capability Action - Perhaps it is better to relate to the rod's action as kind of the rod's flexibility level. There are three rod action levels: slow, medium and fast. If we divide the rod to three parts bottom part, middle part and top part, then for slow action rod will bend in the bottom part of the rod and this means that it is harder to cast with it for long distances. Medium action rod will bend in the middle part of the rod when it is loaded (hopefully with fish ;-)). Fast action rod will bend at the top part and it is easier to handle it with long distance casting. Another aspect that is very important to pay attention to is repair or replace lifetime warranty. Most if not all the reputable manufactures of fly fishing rods have this kind of warranty. It is possible to buy a cost effective fly fishing graphite rod including lifetime warranty on a budget of $100 (USD). Do not buy fly fishing rod without this warranty!